May for me means a couple of very special Birthdays for a couple very special ladies in my life - my bestie and my God daughter. Shh don't tell them, I will definitely have to be careful what I say when I share this one on Facebook! 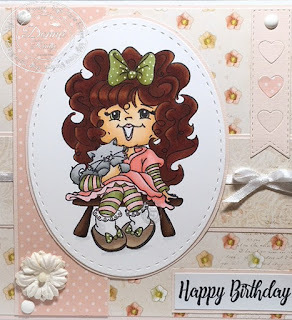 Annalee is perfect for my Bestie's Birthday card. My Bestie loves cats and has always had one or more in her house as long as I have known her. She is my favourite red head and it was fun to colour up this stamp for her - red hair and all! After colouring up my stamp with alcohol markers, I cut it out using a stitched oval die. I cut my patterned paper pieces to fit the layout I decided on and stamped and cut out my sentiment. I added a stitched heart banner, ribbon, and a flower. Some gumdrops finish off my card. Wow your Bestie is going to love this cutie!! Awesome colouring on the hair! 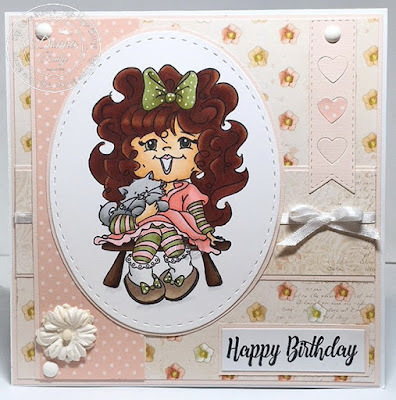 Another amazing card my friend!